Visit the secluded and serene resort villages of West Bengal namely Mandarmani and Tajpur, enjoy local sightseeing of the popular attractions. Explore the sandy beaches of Mandarmani and Tajpur, and let the serene beaches enchant you. Indulge yourselves in several outdoor adventure activities like ATV rides, Jet Skiing, Van riding and many more in Mandarmani. Service of an experienced driver and well-maintained driver to drive you around. Mandarmani is a small resort village in the state of West Bengal and is gaining popularity by each passing year. One can spot red crabs crawling over the 13 kilometres long beach, Mandarmani beach is considered as one of the best driveable beaches in India. The beach is dotted with local shops selling shells, handmade jewellery, and handicrafts. There are many quality resorts in Mandarmani and you can avail the adventure activities through your respective resort. Tajpur, on the other hand, is a secluded beach with similar characteristics as Mandarmani, one can enjoy strolls on the beach and enjoy the scenic location. Slowly and steadily Tajpur is gaining some popularity in the tourism scene of West Bengal. Tajpur is a perfect getaway to rejuvenation and relaxation for any tourist. 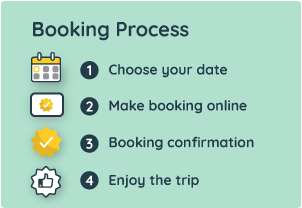 The tour starts with your pick up from your hotel/residence in Kolkata city limits at a time of your preference (select the start time while booking). The drive to Mandarmani from Kolkata is about 170 kilometres and may take up to 4.5 hours. Once in Mandarmani, check in to your hotel and take some rest if you wish. When ready and rested, head to the serene beach of Mandarmani about 13 kilometres from the main town area. Beaches here are famous for the red crabs and you might get the chance to spot a few. Relax by the beach and explore the small local shops which sell shells, handmade jewellery, and handicrafts. Some water sports can be enjoyed at the beach. At the end of the day's tour, return back to your hotel for the night. Start the second day of the tour with the pick up from your hotel. Tajpur is about 20 kilometres from Mandarmani and the drive may take up to 30 minutes. Tajpur is famous for its beautiful beach, once there, spend time visiting the beach of this resort village. Visit the Sankarpur fishing harbour, which is about 17 kilometres from Tajpur. Most of the beaches here are muddy but a good option if you want to avoid the crowd and would like to taste the seafood. Alternatively, you may come back to Mandarmani and relax in your resort and have lunch. Later in the evening, enjoy the sunset at the Mohona, where the river meets the sea at the Bay of Bengal. Start the journey back to Kolkata and get dropped at your hotel/residence in the city limits.